The Zeiss Victory HT 10x42 binoculars have the new High Transmission (HT) Schott glass which achieve a massive 95% light transmission! ZEISS HT – innovative optical design with HT lenses by SCHOTT - represents a light transmission capability that was previously unheard of. It was developed for use when hunting, to ensure that critical details can still be seen even in the deepest twilight. The new SCHOTT HT lenses also have all the benefits of the FL models, such as fluoride lenses for maximum image sharpness and colour correction, advanced T* coatings, inverting prisms with low light capability and the LotuTec® coating for clear visibility whatever the weather. However, the real advantage lies in the fact that these lenses, with their unrivalled brightness, have set new standards, with more than 95% in the field of light transmission. Unrivalled brightness, thanks to a light transmission of up to more than 95% - this unique result is created by the innovative optical concept of the VICTORY HT range. It is made possible by the perfect interplay of SCHOTT® HT glass, the Carl Zeiss T* multi-layer coating and the Abbe-König prism system. This innovative, high-performance package will enable you to enjoy the true majesty of nature, even in poor light conditions. Top quality user ergonomics – that is the promise of the new Comfort Focus Concept focussing wheel. The strikingly large focussing wheel is set a long way forwards on the bridge. You will be aware of the benefits the very first time you use the binoculars. The focussing wheel lies below your index finger, your thumbs gently grip the barrels while the remaining three fingers rest easily next to your index finger. 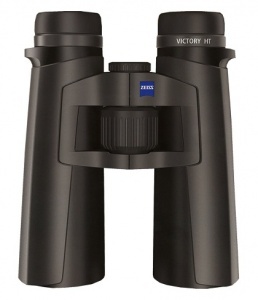 You will no longer have to think about how to hold the binoculars. The particularly long gearing of the focussing wheel allows you to focus on your target quickly and accurately. Make the most of the full richness of colour and brilliance. The outstanding lens construction, using lenses made of high-performance fluoride glass - FL for short - helps you to see the colours with more brilliance and natural authenticity. Chromatic aberrations are kept to a minimum. I was an EL user from the beginning but after a morning testing the new ELs and the HT i had to chose the HT.The ELs are stunning but the HTs are a step beyond.